Me and my elder daughter were walking back to our home from the park, after a very refreshing morning walk. And then we saw a cat and dog chase, with the cat winning to escape the claws of the furious dog, in the end. What made the cat escape from a disadvantageous position? And what does it teach us in our lives? Lets read on. Although it was the beginning of May, the weather on the beautiful Saturday morning was unusually pleasant. Weather, in fact, has been very unpredictable this year. It has been raining when it is supposed to be scorching heat. Anyways, me and my elder daughter, Arushi, made the best use of the beautiful weather by walking, running, exercising, and doing some catch practice in our nearby park. The trees and grass was smelling good and the dust had cleaned up from the tree leaves because of the overnight rain. It was a time very well spent and a day very well started. As we were walking back to our home from the park, what we saw was completely astonishing. We saw a black cat under a huge tree outside a big house, looking for something, perhaps something to eat. Around 15 meters away from it, was a dog, who was staring the cat. The cat was completely unaware of the dog and the impending danger, but the dog's tongue was licking as if he could not believe his stars. We could see both of them, and we knew whats going to happen in the next few seconds. The dog started to walk carefully with numb feet towards the cat. Careful and fully aware of the opportunity in front of him, the dog did not want to give it away at any cost. He was also very clever. He chose to reduce the distance between him and the cat by covering a major portion of it from behind the tree, where, the cat could not locate him. It was just 3-4 meters perhaps left between the two, and the cat had still not realised what was in store for her in the next few seconds. It was decision time. Dog knew that any further steps towards the cat, walking over the crumpled leaves lying all around him, will send an alarm to the cat. He had no time. He decided to give its best shot. He decided to jumped towards the cat, and executed the decision instantly. When it was about 1m left between the two, the cat sensed something fishy. She sensed the dog within a striking distance. She could see the dog from the side of her eyes now. She knew that she barely had enough reaction time to escape the jump. The dog was not going to leave her today. And then what we saw was totally astonishing and one of life's great learnings. The cat jumped over to the nearby house, the dog followed, the cat moved to a small window from where she escaped out of the house, and then jumped back in the house verandah again. She climbed the wall, and then back down, out of the house again, and then in again. The dog was equally agile and was trying its level best to keep pace with the fast changing positions of the cat. 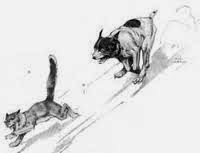 After a few seconds of this super duper chase, the cat had increased the distance so much that the dog was losing sight of the cat during the jumps, and in one such jump, the cat jumped across the road and went into a safe borough. The dog had no clue where the cat had gone. The entire episode ended in less than 15 seconds. We felt relieved that the cat was able to save her life. What saved the cat, in spite of the fact that the dog was as agile as the cat was, if not more? And the fact that the dog was in an advantageous position to start with? And the fact that the cat had very less reaction time, and was taken by surprise, while the dog was fully prepared? And the fact that dog was a faster runner than cat, and was more well built than cat. What saved the cat was continuous changing of her positions - quickly enough that dog could not keep pace with her changing positions. I can bet that if the cat was running in a straight line, there was no way she could have escaped this well built, fast running dog. She was no match to the dog on the speed front. As we started to walk back to our home, a chain of thoughts engulfed my mind. I realised that similar things happen with us in our lives. We are unaware of what is store for us in the future, just like the cat was completely unaware of the dog. We don't know which dog type situation will jump at us and when. The issue is that we tend to run in a single straight line, as we see everyone around us doing the same thing. We keep doing the same thing, assuming that it has to be right, because everyone is doing it. We do not challenge ourselves to try and change our path and try out new things in life. If we have to successfully escape the dog, it is important that we learn to change, fast !! Staying in our comfort zones is a recipe for disaster in the long run. Continuing to try out new things, without worrying about failures is what builds our wisdom, and makes us a better and a happier person. So, if you had something in your mind that you have been wanting to do - like learning guitar, writing a book, trying to sing, travel around the world, opening a restaurant, learning and investing in stocks, or whatever - go out and make an effort to try it out. You will love it. More important, you need it. You need to change your position, for life will keep throwing surprises, and you got to prepare yourself much before. Chapter 5.2 ~ Understanding the Soul - Happiness Unlimited (the book) - Launching June 2014. If you dont use it, you lose it ! !